Programs like the Conservation Reserve Program (CRP) provide important habitat for Lesser Prairie-Chicken; that is widely recognized by land managers across the region. However, few scientific studies have documented the importance of CRP to maintaining this species. 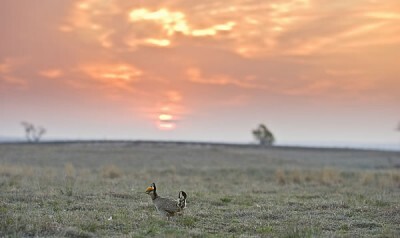 In addition, those involved in habitat conservation efforts also often invoke the need for “large blocks of habitat” to support Lesser Prairie-Chicken, but there is relatively little information in the scientific literature to provide guidance on the size of area that is important to this bird. To answer some of these questions, Playa Lakes Joint Venture (PLJV) recently completed a Conservation Effects Assessment Project for the Natural Resources Conservation Service (NRCS) that evaluated the relative importance of native grassland and Farm Bill programs to Lesser Prairie-Chicken populations. As part of the project, PLJV staff evaluated the number of acres of native grassland, as well as acres enrolled in the Conservation Reserve Program and Environmental Quality Incentives Program, against lek data at various spatial scales across the range of the bird. “This information is useful for understanding the appropriate spatial scale at which conservation efforts will be most important,” says Anne Bartuszevige, PLJV conservation science director. Both the amount of native grassland and Conservation Reserve Program grassland were important predictors of Lesser Prairie-Chicken lek presence. The analysis showed that the amount of CRP was important out to the largest spatial scale tested, which was 31,416 ha (77,630 acres). This result indicates that Lesser Prairie-Chickens respond to amount of habitat in the landscape at much larger spatial scales than previously thought. In addition, this result supports anecdotal evidence that CRP is important for Lesser Prairie-Chickens. PLJV staff also evaluated the importance of the Environmental Quality Incentives Program (EQIP), a major component of the NRCS Lesser Prairie-Chicken Initiative, to the bird. The amount of grassland or CRP may not be the only factor important to Lesser Prairie-Chicken presence; how that habitat is configured (e.g., large patches or several small, fragmented patches) may be important as well. Preliminary analyses of landscape structure indicate that a combination of composition (grassland) and configuration (patch size and continuity) are important for Lesser Prairie-Chicken conservation. “Our findings show that by targeting USDA Farm Bill programs strategically within the Lesser Prairie-Chicken range, we have the opportunity to contribute to large blocks of habitat needed for conservation of the Lesser Prairie-Chicken,” says Alex Daniels, PLJV GIS Director. For more information, read Relationship of Lesser Prairie-Chicken Lek Presence and Density to Grassland Conservation Programs.